This vinyl privacy fence goes great on any property in Tampa, FL. 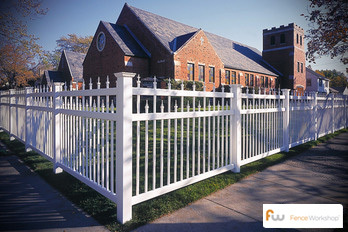 Fence Workshop™ of Tampa, FL is a Tampa fence company and leading supplier of vinyl fences and gates. We supply vinyl/PVC picket, privacy and post and rail fencing for residential and commercial customers in and around Tampa, Florida. Tampa is a city full of history and charm, but also very modern and cutting edge. All types of homes and properties can be found throughout the city, and a vinyl fence is versatile enough to accommodate all of them. 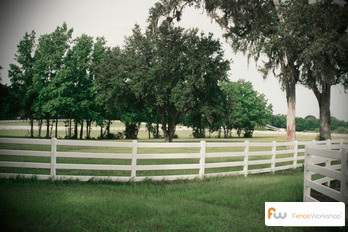 We match your new fence perfectly with the styles and landscaping already present at your property. Vinyl fencing is one of the longest lasting and most aesthetically pleasing fencing options available. While most of our vinyl fences are white, they are also available in brown and off white colors. If you’re looking for a professional Tampa fence company to supply a vinyl fence for your home or commercial project, we want to be your go-to fence company. Why choose Fence Workshop™ for vinyl fencing in Tampa, Florida? We supply all styles of vinyl fencing (privacy, picket, post and rail). 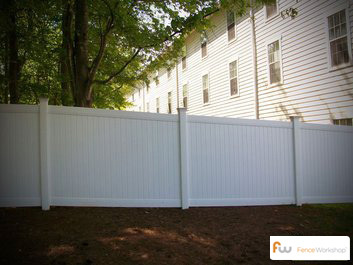 We supply vinyl fencing to residential customers and commercial contractors alike. Our vinyl fences are built to last and have interior walls that are up to 3x as thick as comparable vinyl fences. Our vinyl fences are partially made from recycled materials. Our vinyl fences come with a best in class manufacturer warranty. Chain Link Fences In Tampa, FL. Farm Fences In Tampa, FL. Steel Fences In Tampa, FL. Wood Fences In Tampa, FL. Aluminum Fences In Tampa, FL. Fence Materials In Tampa, FL.